Victoria Beckham caused a sensation when she was photographed wearing one on a magazine cover - and the fashion pack is going crazy for them! Especially on long, long sexxxy, slinky Sterling Silver chains! 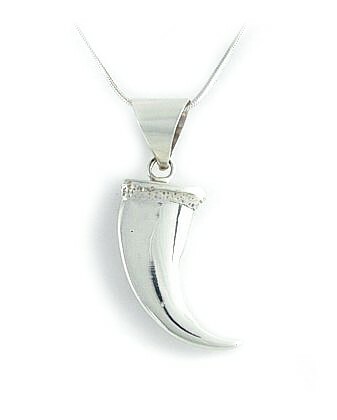 Yes, shark-tooth-shape/horn necklaces are THE look. This superlative version is pure Navajo Sterling Silver and if initial reactions are anything to go by, this is absolutely must-have!!!!! Pendant size from top of clasp 5cm (2") on Sterling Silver Snake Chain.